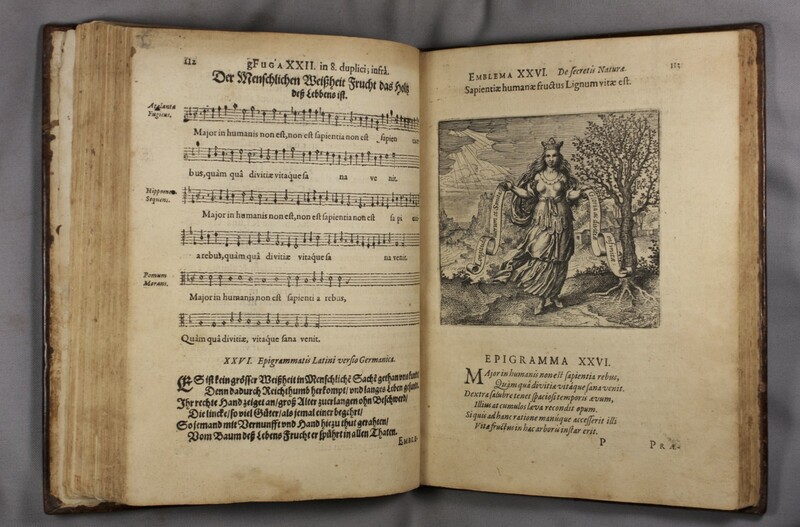 Since 2014, Les Canards Chantants has been part of an international, interdisciplinary team of scholars to study the 1617 alchemical musical treatise by Michael Maier, Atalanta fugiens. The book is a fascinating seventeenth-century example of a multi-media work, containing prose, poetry, imagery and music. 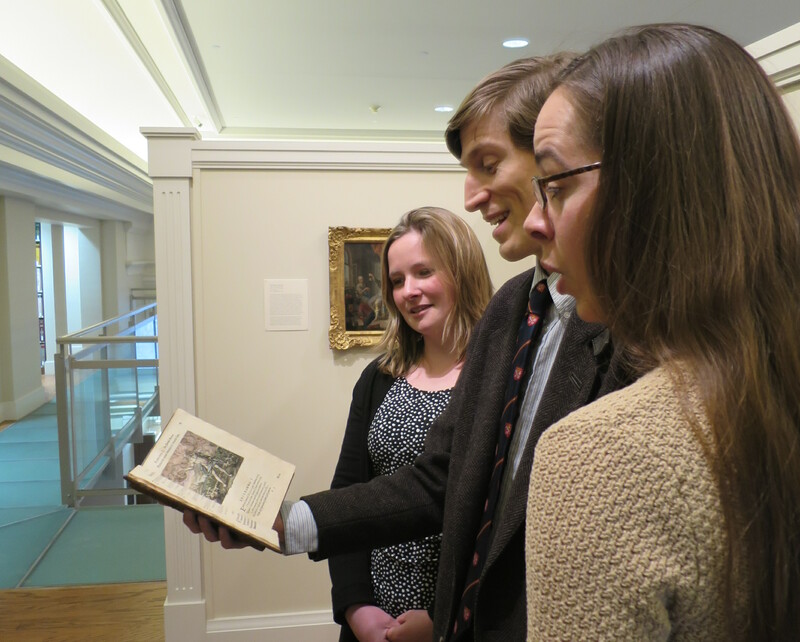 The team of scholars includes early modern historians, mathematicians, philosophers, classicists, alchemists, rare book specialists, chemists, musicologists and performers. Emblem 26, featuring an epigram about Sapientia (lady wisdom) and a canon at the double octave. Atalanta fugiens consists of fifty emblems. Each emblem is made up of an epigram, an engraving, and a three–voice musical composition, which Maier calls a “fugue”. Maier uses the Greek myth of Atalanta as a metaphor for the alchemical process of making gold using the elements mercury, sulfur and salt, which is in turn a metaphor for the pursuit of true wisdom. Maier’s music illustrates these layers of meaning and metaphor in various ways: the three voices of each “fugue” are labeled Atalanta (mercury), Hippomenes (sulfur) and the Golden Apple (salt). The Atalanta and Hippomenes voices are always in canon, and Atalanta always leads, as in the myth. The Golden Apple voice is the same in every fugue, a cantus firmus that provides a foundation for the other two voices. Some individual fugues attempt to illustrate the meanings of the epigrams and engravings they are paired with. Maier attempts to exhaust all available canonic devices, varying the interval of canonic imitation, and employing retrograde and inversion. Some of the fugues are printed in cryptic ways, and can only be performed with the help of specific instructions on how to decode them. Maier’s music is chromatic, with many examples of unconventional harmonies and voice leading; in short, Maier broke a lot of compositional rules. Some scholars assert that Maier was simply an amateur composer; others have suggested that his printer introduced many errors. Musicologist Loren Ludwig has recently discovered that many of Maier’s fugues are subtly manipulated copies of canons from a collection by John Farmer, the English madrigalist. In light of this discovery and some mathematical hypotheses regarding the structure of the book, we are exploring the possibility that the music may contain a hidden cypher that would further illuminate the intended purpose and role of the music and the book as a whole. We know very little about what purpose this music was intended to serve during Maier’s time, and how (or if) it would have been performed. Thus far, the music Atalanta fugiens has been studied from a musicological perspective and has been recorded. Our task as part of the Atalanta team is to bring those two perspectives together, seeking scholarly insights that arise only through the process of actually reading, singing and hearing the music. Read more about this ongoing research project in the following article by Jason Laughlin for the Philadelphia Inquirer. Watch a lecture at the Bard Graduate Center, featuring early modern historian Donna Bilak, musicologist Loren Ludwig and musicologist Graham Bier, with performance demonstrations by Les Canards Chantants.